Home / Homepage / The Big Bundle Of 185 T-Shirts And Posters Ready Designs! "Style is a reflection of your attitude and personality." 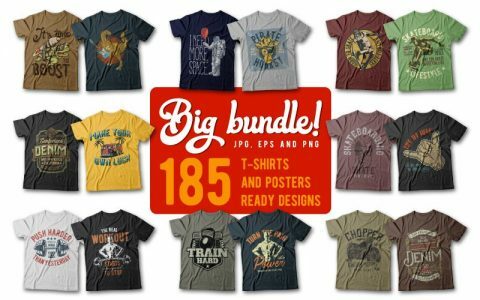 To dazzle your personality we got you the Biggest 185 T-Shirt Design Bundle. It's the easiest and quick addition to your wardrobe. Wait no more! Buy it for just $29. What Exactly You Will Get In This Big Bundle? Vector files included in this bundle are fully customizable. Text blocks are included in outlines because many of them have licensed fonts. All graphics are unique and handcrafted, especially for this 185 T-Shirt Design Bundle. Standard and Extended license are included for the same price! Instant digital download on the purchasing the product. All products to be delivered with an Extended License. This means that the products can be used for both commercial and personal use for an unlimited number of times. Reselling or redistribution of the products from this bundle is restricted. This bundle is a Lifetime Access deal. So... what are you looking for?? Do it big, do it right and do it with style. !